In recognition of the first 100 years of city planning as a profession, APA has selected 100 essential books of planning. While I think the word “essential” may be a little strong, considering that most professional planners have probably only read a handful of these, this is a nice departure point for some summer reading. Thanks to Google and the University of Michigan and Harvard libraries, we can download the ones with expired copyrights for free (beats the $$$ for some of these used on Amazon). 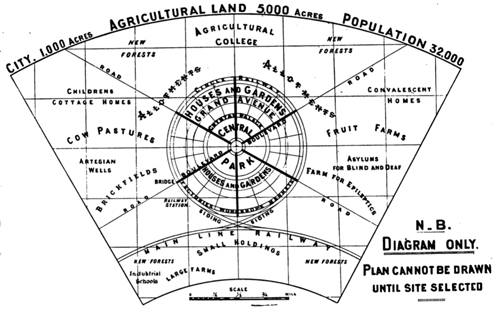 Ebenezer Howard would be an intriguing place to start, going back to the turn of the 19th century. Pretty much excoriated by Jane Jacobs in the 1960s as a “decentralist” utopian against real cities, he still has many defenders today. Robert Fishman attributes the more contemporary concepts of transit-oriented development and urban growth boundaries to Howard: “Calthorpe's Portland regional plan is basically Ebenezer Howard's Social City, with some new color graphics.” Peter Hall sees Howard has an anarchist, something he appreciates, and insists that contemporary planning could gain from returning to its garden city roots. Presented here are my reactions to reading Garden Cities of To-morrow for myself, and hopefully I’ll convince you to download a copy for yourself too. The famous part of the book is the first chapter, where the plans for the Garden City are laid out, but it only makes sense in light of some more foundational principles revealed in subsequent chapters. He goes right into giving precise prescriptions for the new city, down to acreage and expenses. 6000 acres of cheap rural land are to be purchased, 1000 of which are reserved for the city. A 32,000 person population cap is set, after which a new city will have to be colonized. As far as the design goes, Howard wants to make it as little like the overcrowded London of his day as possible, so public parks and private lawns are everywhere. The roads are incredibly wide, ranging from 120 to 420 feet for the Grand Avenue, and they are radial rather than linear. Commercial, industrial, residential, and public uses are clearly differentiated from each other spatially. The overall goal for Howard is to combine the traditional countryside with the traditional town. For too long residents have had to make the unfulfilling choice between living in a culturally isolated rural area or giving up nature to live in a city, but "human society and the beauty of nature are meant to be enjoyed together." As he sees it, in a rather Hegelian fashion if you ask me, the two "magnets" of Town and Country that have in the past pulled people in either direction will, in the future, be synthesized into one "Town-Country magnet." Someone just needs to build the first one. As fantastical as the first chapter hits us (or me at least, especially a "crystal palace" element), Howard is completely earnest in his attempts to get it built. In fact, most of the book can be read as a business model being pitched to potential investors. He assures interested parties that he can get them a 4.5% return. Howard makes it clear that he is not a socialist, and he does not see centralized government playing an initial role. The closest thing I can relate his plan to is a homeowners' association on steroids, he calls it a "quasi-public body," which owns all the land of the city and leases it out to residents. The financial linchpin of the plan is the fact that all of the land is purchased up front, so that the increase in property values generated by the growth will be captured by the community itself. He also assumes that if everything is planned rationally from the beginning, the costly process of retrofitting old infrastructure for new technology can be avoided. A few philosophical commitments jumped out to me right away as integral to his whole project. First, Howard deliberately tries to steer a course been collective and individual authority, a basic paradox he sees as rooted in human nature. He suggests a pragmatic approach to sorting out where the impetus should be placed. If the municipal authorities do a good job they should keep doing it, otherwise it should be handed over to private enterprise. Ultimately, he sees these two spheres are headed in the same direction. "There is a path along which sooner or later, both the Individualist and the Socialist must inevitably travel." And it leads right to the Garden City. There's the historically progressive synthesis again. Howard's enthusiastic embrace of progress just drips from every page. He even sees human beings becoming less selfish, as modern advances in science and technology open up frontiers of human flourishing. Newer is better, just as the railroad is better than the stagecoach. After laying out his final vision for a network of brand-new garden cities, what he calls the Social City, he briefly considers whether any of the older cities can be salvaged and readapted. Not really. After a precipitous fall in land values, due to migrants opting to move to the newer garden cities, London will have to be mostly destroyed. Only then might it be refashioned into a modern city. The earth's "infinite treasures"? hmm. This is why the loss of agricultural land to perpetual greenfield development was of no concern. Even on the little island of England, farmland seemed to go on forever. Howard wanted to use local materials to build extravagant new structures but never considered that they may simply run out. Additionally, he never considers how this build-it-from-scratch attitude matches his belief in constantly expanding technological progress. Why would the Garden City be the final stop of history? Would not it also have to be destroyed and replaced when the newer model arrives? (It actually would have within a few decades, because Howard never considered the prospect of automobiles). I have some design quibbles too, particularly with how he envisions human traffic flowing through the city, but that wouldn't be fair because Howard was more of a social visionary than a designer or engineer. The layout he sketched was conceptual and he knew it. He also didn't understand how regional economic forces agglomerate. He assumed jobs would just follow people wherever they wanted to go. However, it's best to keep criticisms focused on the a broader philosophical level. "Town and country must be married, and out of this joyous union will spring a new hope, a new life, a new civilization." "The one age-long certainty, the antithesis of town and country, is already breaking down. Two diametrically opposed, dramatically contrasting, inevitable types of beauty are being displaced by one drab, revolting neutrality. Rural influences neutralize the town. Urban influences neutralize the country. In a few years all will be neutrality. The strong, masculine vitality of the town; the softer beauty, the richness, the fruitfulness of that mother of men, the countryside, will be debased into one, sterile hermaphroditic beastliness." The problem of "the One and the Many," a unified whole set up against diverse components, has vexed philosophers and theologians for centuries. Christian theologians, at least, gave up trying to decide whether God was one or many by around the 3rd century AD. They just let the paradox be and called him the Triune God. Howard's synthesis, on the other hand, is too neat and simple. It's all unity and little diversity - which, of course, is what Jane Jacobs stepped in to remedy several decades later. So how am I going to leave this on a positive note? 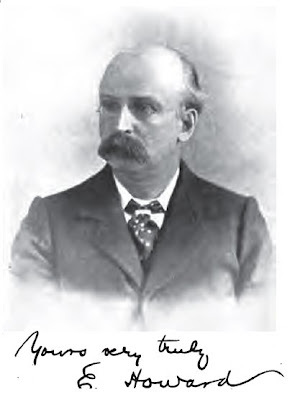 Nobody as well-respected as Ebenezer Howard could be completely off-base. There are lessons to learn from the man. He did have a good grasp on the problems associated with his rapidly industrializing England, which, by the way, seems to me a similar phenomenon to what is now occurring in the developing world. There really is a human proclivity for the "free gifts of nature," which were being pushed away and cut off by dirty factories and crowded streets of 19th century London. Even if it is impossible for humans to indwell nature as he proposes without killing it, we still yearn for the chance to visit, to remain connected. Howard identified real social inequities arising from industrialization as many of his peers had, and he believed these could best be addressed at the local level, what he dubs a "pro-municipal" scope. Furthermore, I believe his advocacy for rational planning over the chaotic growth of piecemeal evolution has some merit in a rapidly modernizing context. Another Garden City reformer Raymond Unwin puts his finger on why this is the case, but I'll get to that in a future post. I enjoyed the book and am especially intrigued by the solution presented, that is, buying land and leasing it to the population. I believe this resolves many social ills present in our modern fee-simple property right system. I agree with your critiques but I suppose I don’t blame him. He’s a child of the enlightenment. Progress is king. Human purpose is to subdue Nature. Perhaps he should have lent an ear to Malthus. That said, I am happy to gloss over these parts given the remaining parts which are so good. One interesting thing about this book is the backward “kickback” of reform to the mother city that must result if such a city were built and it proved successful. London would in fact empty-out and decay from the inside if more socially just and well planned communities were created just outside the boarders. But this would ultimately lead to a more socially just London. “Creative Destruction” in the economic jargon. As for Howard’s proposal, I think we could modernize it easily in a more ecological manner. We could locate it on a brownfield, for example, and follow a more urban, transect based planning scheme. In so doing I think we keep the heart of Howard’s vision while reforming the logistics per our more advanced knowledge. I agree that Howard had the kernels of some really good ideas that are still relevant. When you mention advancing Howard's ideas with practices we now understand better, the notion of commuting comes to mind. As far as I can tell, Howard never envisioned anyone commuting outside of the town for work. Everything was supposed to be fairly self-sufficient with labor (although there would be some trade going on). That's no longer true, so it may require the adapting of Howard's plan. He placed the rail station on the outside of town, because it would only serve industry and he understandably wanted to keep this away from the garden center. But retooling the concept for commuting would require the station to be near the center of town. I guess that's one way the garden city notion could be meshed with contemporary notions of Transit-Oriented Development. Daniel, I enjoyed this blog entry tremendously! Being a life-long amateur in the field of urban design, I haven't been exposed to classics like Ebeneezer Howard, so I really appreciate being introduced. In Ebeneezer, I may have found a soul-mate. How is Ebeneezer's "marriage" of town and country a collapsing of identity, when only 1/6 of the land is built up, and the rest is open? I like the analogy of marriage, which is very basic and "organic" - how is it crude? I love Ebeneezer's idea of having convalescent homes and children's cottages situated between the field and forest areas. The farm for epileptics is a great expression of social conscience - probably not how all today's "experts" would handle people with disabilities, but reasonable for all that. Interestingly, Ebeneezer's design is almost point-for-point the same as a concept I've proposed for a self-sustaining transit-oriented village with a population of about 10,000 (http://washtenawtod.blogspot.com/2009_01_01_archive.html). Quibbles aside, I've enjoyed your blog and will follow it with pleasure, so thanks, Daniel! Thanks, Faramir. I do see your point. There isn't anything wrong with the marriage analogy, per say, but it does seem that Howard leans more on the unity than the diversity side of urban and rural form. At least philosophically, he seems convinced that the ideal is to mix the two together as much as possible, and his actual plans for keeping dedicated farmland seem to be more tied to the necessity of providing food than an ideal arrangement. I agree that the 1/6 ratio of city to farmland is a good one, but Howard's conception of the city portion of his plan does contain a huge amount of open space itself. A large park in the center, a few layers of greenbelts, and fairly spacious private lawns throughout. Parks are great, but to me, he might be swinging the pendulum too far away from an overcrowded London. I can't help but feel that they way Howard envisions "Garden Cities" is actually pretty great and reminds me a lot of the recent push to once again produce much of a towns produces close to home in "Market Gardens" just outside the town. 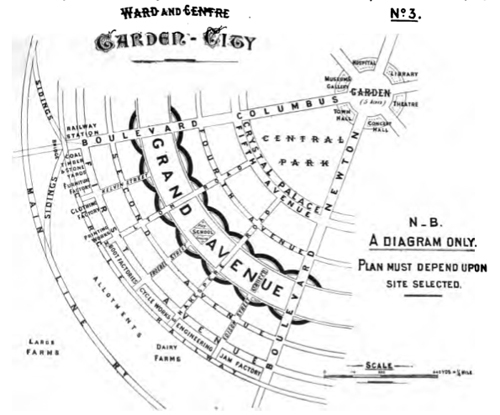 If Howards ideal of the "Garden City" had been implemented instead of Frank Lloyd Wrights vision of it with, maybe the world would be very different. One thing that amazed me is the compact nature of Howard's proposed towns, not at all like the sprawl of a modern suburbs. Jane Jacobs hits on the density of "suburbs" in Death and Life. Of course when she is referring to suburbs she is mostly talking of the original "street car" suburbs taht ringed cities prior to WWI. Both Howard and Jacobs view low densities as something far different than what we are now used to. Jacobs says that anything under 20 DUs per acre is low and that a good number for a suburb is 12 DUs/acre. That is far higher than most suburbs (I grew up in a house on a quarter acre lot). Another facet of Howard's design is that these towns would actually make for great commutting suburbs if strung along a rail line. Yeah. Howard is growing on me. After reading the post and the comments. I thought to my self that we are all drawing to the same concussion, that things must change. In the way how we live in cities around the world. This design concept is best solution for economics and utilization of resources. We should have a primary design of sustainability and a holistic, and symbioses relationship with nature. I think that Ebenezer Howard's Garden City concept, was greatly amplified by Jacque Fresco with the Venus Project. There is an organization that promotes the ideas of a sustainable sociality that would flourish in a city that which is proposed by Ebenezer, and Jacque. The Zeitgeist Movement is where we can unite for this cause. Great post. The heart of any settlement must be a garden. Gardens are natural, alive, evolving, social, abundant, open, dynamic, organic, expressive, multisensual, places enjoyed by all species and all ages, social classes etc they are places to relax and commune, places of easy conversation, places to reside and find solace as well as be inspired. A garden can feed you, teach you, embrace you, sting you... it does all of this without intention by Nature's invention... who is the highest order of architect? Not to mention the endless scientific evidence that suggests access to green areas, and most imnportantly wilderness have meassive beneficial effects on psychological states. can we say all this about a shopping centre or a CBD? Dont think so... shame that the heart of our cities and nation is consumerism and economics if the two were ever distinct. Great article... hopefully wont be too long now. From : Planner Mahadhe , Urban Plannre, Bangladesh. "Naw a days people planners place all are thinking about the Garden city. starting Green Economic, Green Banking. but this concept was strated by Ebenezer Howards, now a days Green is a movement". Very interesting. Thanks for writing and sharing this post and also some comments about Howard. I live in a very little garden city near Milan. Italy. Its name is Milanino. If you want to have a look at it, try google earth. After one century from its foundation in 1909, you might see how it looks like ;) especially if looking at all the other "urban planning products" sorrounding this little oasis. Living here is not bad, in my experience, though the social purposes are completely gone, the green thinking is still alive and at least there are beatiful ancient trees and gardens and little houses all around .. fifteen minutes from the centre of Milan by train. Ah, and still today some agricolture remaining .I think that after all, this place and its planning concept and design may be considered as a present from the founders to today's citizens :) Regards.ciao. Arch. Riccardo Chiaromonte. P.s.if you want to see, there are some recent and ancient photos of Milanino on our fb page studio chiaromonte or from www.studiochiaromonte.com. When is an urban forest large enough?